On April 9, 2019, BBJ Group hosted a webinar on Whose per- and polyfluoroalkyl substances (PFAS) Is This?, with presenter John Baker, discussing the basics, examples and possible treatment options of the newest emergent group of chemicals, PFAS. We’ve seen updated standards for drinking water, soil and surface water being implemented weekly, and the next objective is to identify which types of treatment options are available for PFAS contaminated sites. PFAS consist of a group of several different synthetic substances that have been produced and widely used for approximately 50 years. PFAS compounds are used in nonstick coatings, textiles, paper products, some firefighting foams, and many other products. These compounds have many manufacturing and product applications because they repel oil and water, resist temperature extremes and reduce friction. The scientific community is rapidly recognizing the environmental and health effects of PFAS. PFOA, a subgroup of PFAS, are linked to cancer risks mainly targeting the kidneys in humans, while PFOS are connected to low birth rates. Human exposure to PFAS can be linked to a range of media from inhalation, ingestion and even absorbed through skin. The stability of PFAS means they are extremely persistent in our bodies and the environment. Some PFAS can last eight years in our bodies, leading to an accumulation over time. John Baker spoke of several major sources of PFAS, which included the following: fire training/fire response sites, manufacturing/industrial sites, landfills and wastewater treatment plants/biosolids. Other point and diffuse sources of PFAS exist, and may be significant locally but generally are expected to be small by comparison. 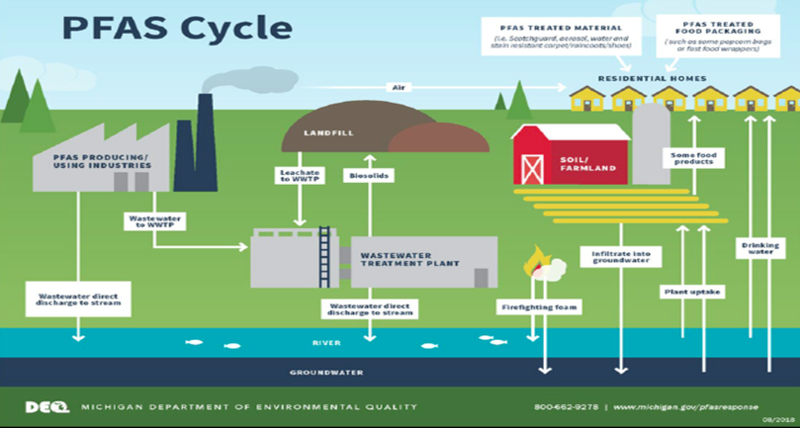 Manufacturing facilities that may release PFAS into the environment include textile and leather processors, paper mills, metal finishers, wire manufacturers, plating facilities, as well as facilities using surfactants, resins, molds, plastics, photolithography, and semiconductors. Landfills constructed prior to 1990 are not required to have a synthetic membrane liner, or leachate collection systems, causing waste to be in direct contact with the surrounding media. Leachate collected from landfills is typically treated on-site or transported to either a nearby municipal waste water treatment plant (WWTP). The processes for managing leachate have implications on the ultimate fate and transport of PFAS. Municipal and industrial WWTPs can provide the following pathways for PFAS to the environment: point source discharges of effluent; leakage or unintended releases from surface impoundments; air emissions; or disposal of biosolids and other byproducts generated during the treatment process. John Baker provided a state specific case in Michigan where PFAS detections have been greater in the publicly owned treatment works (POTW) effluent sample than the influent. Biosolids are the nutrient-rich organic materials resulting from the treatment of domestic sewage in a wastewater treatment facility. Biosolids are a beneficial resource, contain essential plant nutrient and organic matter, and are recycled as a fertilizer. However, if the biosolids from the wastewater treatment facility contain increased concentrations of PFAS the soil within the land spreading area will also have increased concentrations. PFAS are anthropogenic chemicals that are stable and resistant to biodegradation. So just how long do these chemicals last before they begin to breakdown? Well, PFOAs are persistent in the environment for 92 years, whereas PFOS clock in at 41 years, which is why they are called the “forever chemical.” Because these chemicals are immune to degradation, how do we find a treatment option for them? Current treatment options include granular activated carbon (GAC), reverse osmosis and electrochemical oxidation. The GAC treatment is the most studied treatment for PFAS removal. Activated carbon is commonly used to adsorb natural organic compounds, taste and odor compounds, and synthetic organic chemicals in drinking water–treatment systems; however, GAC works well on longer-chain PFAS like PFOA and PFOS, but shorter chain PFAS like perfluorobutanesulfonic acid (PFBS) and perfluorobutyrate (PFBA) do not adsorb as well. Ongoing studies and tests are being completed in order to find a treatment option that is effective in (1) capturing all chains of PFAS and (2) costs.